According to the Mohs hardness scale, diamonds are on of the strongest substances on earth. However, diamonds can still be scuffed, chipped, or knocked loose. Additionally, precious metals are often very soft. Pure gold, for instance, is much too soft to use for jewelry. For this reason, most engagement ring settings are made from common alloys such as 14k or 18k gold. Because engagement rings consist of precious metals and gold, wearing them to work is not always the best decision. Depending on your ring style and your career, you may wish to rethink whether or not to wear your engagement ring to work. How Does Your Career Affect Your Ring? Depending on your career, you may want to skip wearing your engagement ring to work altogether. Women that work extensively with their hands or with machinery probably fall in this category. In these cases, it’s probably best to keep your engagement ring in a safe spot, such as a ring box. Additionally, women who are care givers should be careful with their diamond ring as well. With so much contact with others, it is possible diamonds on a pave set ring to be knocked loose. Finally, women who work primarily with strangers and the public, such as social workers or police officers, should be careful. However, women who work in an office may find that wearing an engagement ring to work creates little issue. In addition to determining if your career will prevent wearing your engagement ring to work, consider the ring style too. Modern rings, which often feature channel set diamonds and smooth edges, are less likely to cause problems. 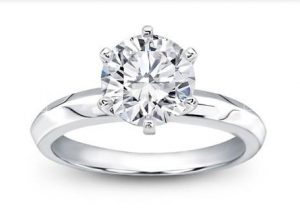 Additionally, solitaire diamonds with tension settings tend to be more durable. Finally, even if your engagement ring features a 4 prong setting, pave diamonds, and a knife edge, you can still wear your ring to work. Be mindful of your ring, your hands, and consider an alternative when necessary. One popular alternative is to wear the ring on a chain during tasks that may damage the ring. In the end, the best thing to do is be cautious. However, over time, your ring will feel as if it becomes a part of your fingers, and you will be more confident wearing your engagement ring to work. Shop Adiamor’s selection of diamond engagement rings today!